While Walk The Moon is currently Cincinnati’s most high-profile pop music export, plenty of other local bands are taking their own shot at conquering the industry. And this one is doing so with a higher-order goal in mind. Telehope is a band of four Cincinnati natives (Mark Brad, Adolph Goetz, Ben Malson, Nate Trammel) whose brand of dance-driven pop music is geared towards sufferers of mental illness, seeking to provide a touchstone of love and understanding. 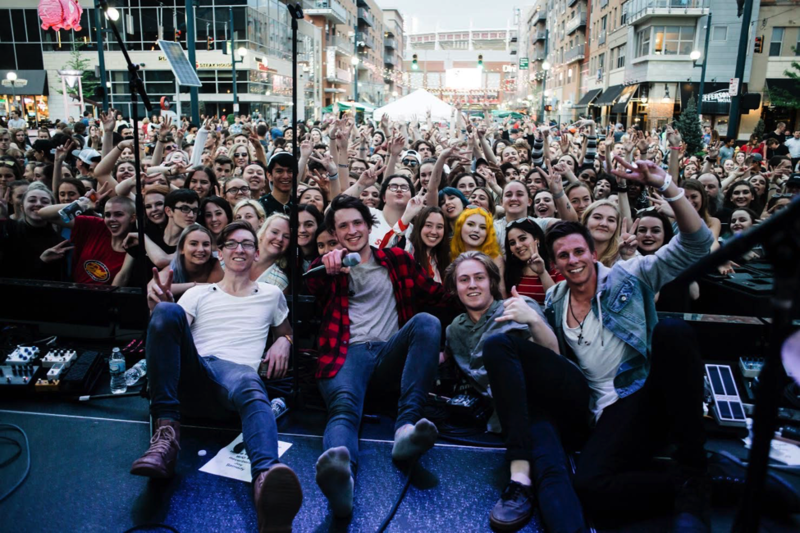 And people are listening: Their song “Joy” was featured on A&E’s Born This Way, and they’ve played with bands such as COIN, Young the Giant, and Public. On July 13, they release their second album, Hello to the Now. We talked to the band about their new album, making music in Cincinnati, and their feel-good, do-good mission. CM: What does Telehope mean? Adolph: We were searching for like a year for a band name. We knew we wanted it to have something to do with hope because we got a message on Twitter from a girl who was listening to our music and decided not to commit suicide because of one of the lyrics in our songs. And that really changed our whole perspective and helped us realize what impact we could have on people. CM: How has your music and mission changed since your first album? Ben: The lyrics have changed—they’re more of a call-to-action. This album especially is focused on anxiety and depression and bringing that to light, exposing that, and bringing words of understanding but also, in the end, encouragement. CM: Looking ahead, what are some of your goals for this next year? Ben: One of our shorter-term goals is to go on tour and open for a more well-known band, such as COIN or 21 Pilots. Right now, someone like COIN is more realistic because we just opened for them and now we have a relationship with them and their managing/booking agents. [And] we want to release the album obviously. We’re submitting to a bunch of NACA showcases, which is a college entertainment industry booking agency. We played a lot of college shows last year. CM: You’re all from around here. What’s it like playing in your hometown? Mark: I like Cincinnati. Cincinnati’s changing, making good strides forward. I like what’s happening. I like the local music scene a lot. Ben: Yeah, I lived in Nashville in the summer two years ago. And I wanted to move down there for good but I realized how fresh and ready the Cincinnati music scene is.